Good samaritan does exist and this week I met 2 of them. One was a very handsome*blush* guy who helped me when I was depositing some money for my brother one night. He was standing behind me & he helped me by pushing the right buttons (on the ATM people! ).I was embarrassed as I rarely use the deposit machine & I smiled at him & say thank you & sorry & he gave me a bright smile back...*swoon*. Another good Samaritan that I met this week, was when I was buying lunch for my family today. I was on my way back but there were lots of cars coming and going that I couldn’t go to the right side of the road .Now, the road that I’m talking about is the exit between Plaza Masalam & the green 24 hours polyclinic. If you want to go to the right side, it’s quite a pickle as you’ve to wait a long time. I must have looked like a damsel in distress in my black Unser when this huge lorry with cars on it...STOPPED in the MIDDLE of the road & made way for me!!! There’s only 1 presentation left for this semester & other assignments are merely write-ups, article reviews & projects. I’ve been filling my ‘lazy’ moments by what else, playing games! 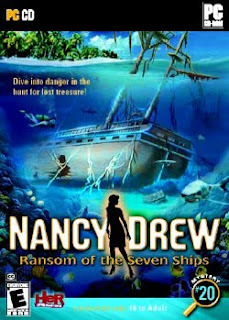 I was super excited when I saw the new Nancy Drew game which is Ransom of the 7 ships that I bought it on the spot & have been solving the mystery since yesterday. And if you’re on my Facebook, you’d know that I’ve been hooked on Scrabble Worldwide in these past few weeks. Although my stats( more losses than wins) are not that good because I forfeit a lot since stupidly I set the time limit of each game that I played as 2 mins, thus because I have other things to do & not being glued constantly to the laptop, my opponent usually gets tired of waiting for me to make a move & click on the ‘force forfeit’ button. sigh. But NOW, I’ve changed my time limit to 1 day thus I can sleep, do assignments, eat & whatnot & still continue playing the next day. So far, I’ve beat many people (mostly guys..hahaha) & the word that I got the most score on was DUNES--for 63 points yo!! !What up( like Barney from HIMYM)!! !I even won when I fought(ceh,mcm wrestling pulak) my adjudicator teacher from like 2 years ago—Yunus(lolsssss) & my friend Syahmi & Faiq(who asked me to give up cos’ that time he was leading waaay more than me but I won in the end...lalaalala..:P)..Oh, there’s a chat box there so you can interact with others & I’ve played against people who live in NZ,OZ,UK & even India! I watched the Princess Protection movie last night & I’ve got to admit,although Demi is not as skinny as her bestie Selena in the movie,she’s way prettier.But,I prefer Selena's fashion sense more than Demi..as I've blogged about her in the past..
A big congratulation to my favorite(and my parents too) Malaysian chef,Chef Wan for beating Jamie Oliver,Nigella Lawson & Anthony Bourdain at the World Gourmand Cookbook Media Awards 2009!Plus,he's going to appear on Oprah! !OMG...He's going to become more well-known after that! ‘The popular chef, whose real name is Redzuawan Ismail, was crowned the Best Celebrity Television Chef in The World, beating 250 other celebrity chefs at the World Gourmand Cookbook Media Awards 2009 held in Paris last month. The power of Twitter:LC(Lauren Conrad),one of my fave reality tv celeb..who now has her own fashion line & just released a book( I want to buy it! )..on Who wants to be a millionaire-- she won 50k & she tweet about it..here's the video!